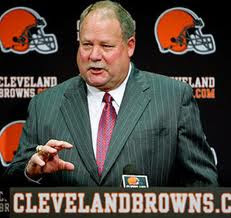 Browns' president Mike Holmgren swept his stern gaze over the journalistic rabble gathered in front of him. As the cameras rolled during yesterday's press conference in Berea, a get-together ostensibly about poor Colt McCoy's horrific prime-time de-cleating and subsequent concussion, Holmgren had something else to add during his matter-of-fact and occasionally prickly media address. "Another irritant to me is that it's 'business as usual' around the Cleveland Browns, it's not. It's not. This was an incident that took place and hopefully after I explain how it happened, you'll understand. Because it's not (business as usual)." The usual business around Berea, as we all know, has been a lethal concoction of terrible football and systemic dysfunction. This concussion flap, an incident that includes claims from the Browns that not a single soul on the sidelines saw the murderous hit James Harrison laid on McCoy, stands as just another controversy in an overflowing bucketful of them. Perhaps we can't blame Holmgren for getting a little tetchy. The new front office is only in its second year and wasn't around when staph infections were plaguing the club or when idiot team executives were sending "eff you" emails to idiot fans. There's no doubt this most recent front office iteration is paying the PR price from the incompetence of past regimes. But a 25-year football man like Holmgren getting defensive, followed by a misbegotten "you're with us or you're not" ultimatum to media members, is not helping matters any. It would be refreshing for Browns' leadership to come out and state, "Yes, we know fans have been dealing with this for years, and we know they're frustrated, but we're working our damndest to change the culture...blah blah blah." As rapping singer Sam Sneed (Ft. Dr. Dre) was heard to remark, "U Better Recognize." Level with us, Mike, because the fans aren't fools and each bad season does not exist within a vacuum. Fans and media alike, with a dozen years of awful football looming huge in their rearview mirrors, are going to take with a cement mixer-sized grain of salt every comment from the front office when an incident of such questionable judgment as McCoy's concussion diagnosis takes place. Does Holmgren understand that we would prefer to be talking about the actual games rather than this nonsense? I'd imagine most folks find the constant controversy around the Browns achingly dull, and would rather be discussing the two division games that end the season and how those contests could win Cleveland the division. Instead, it's another season that's turned into a big pile of dreck- another year where the coach, quarterback and front office are all coming under scrutiny for what's happening both on and off the field. Show fans some respect, Mike, and please, get this franchise turned around. That and only that will turn our jeers into cheers.